One of the best places to slow travel in Tuscany is the Val d’Orcia, with its exquisite art, museums and churches in small hillside villages, its cuisine and epic countryside. We suggest a panoramic tour of the valley, so that the trip becomes a unique experience among the colors and atmospheres of this unique Tuscan landscape. Explore the medieval hillside villages on your way to Siena, marvel at settlements that date back to Renaissance times, try some Pecorino cheese in Pienza, and some wine in Montalcino or Montepulciano, where the refined beauty of the squares and churches blends perfectly with the ancient traditions of its wines. The landscape of the Val d’Orcia was celebrated by painters from the Siennese School, which flourished during the Renaissance. Images of the Val d’Orcia, and particularly depictions of landscapes where people are depicted as living in harmony with nature, have come to be seen as icons of the Renaissance and have profoundly influenced the development of landscape thinking. Val d'Orcia is an exceptional reflection of the way the landscape was rewritten in Renaissance times to reflect the ideals of good governance and to create an aesthetically pleasing picture. 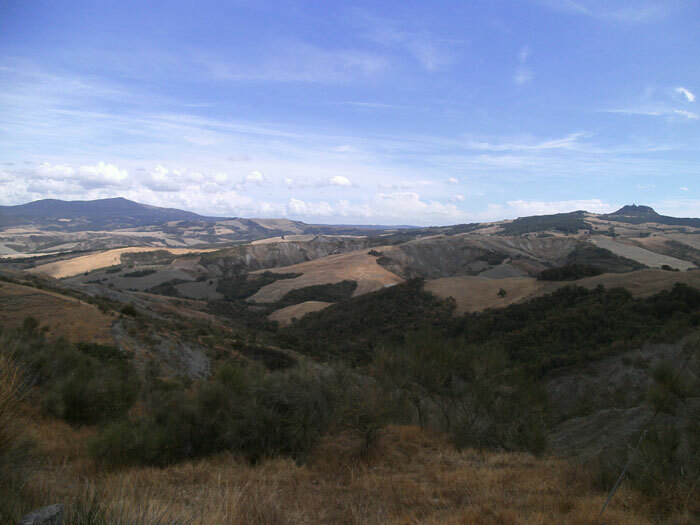 It lies to the south-east of Siena, its northern boundary approximately 25 km from the city centre. The landscape reflects colonization by the merchants of Siena in the 14th and 15th centuries. They aimed to create a landscape of efficient agricultural units but also one that was pleasing to the eye. The landscape that resulted was one of careful and conscious planning and design and led to the beginning of the concept of 'landscape' as a man-made creation. The landscape was thus created to be efficient, functional, equitable and aesthetically pleasing. It was based on innovative tenure systems whereby the estates owned by merchants were divided into small properties and cultivated by families who lived on the land. Half of the produce was paid to the merchants as rent - sufficient to allow the merchants to reinvest in further agricultural improvements. The farms were mixed farms cultivating grain, vines, olives, fruit and vegetables and with hay meadows and pastures for livestock interspersed between the farms. Farmers practised transhumance with routes to Meremma and l'Amiata. An illustration of the aim for the farming landscape to create pleasing pictures is the persistent tradition of planting roses to embellish vineyards. 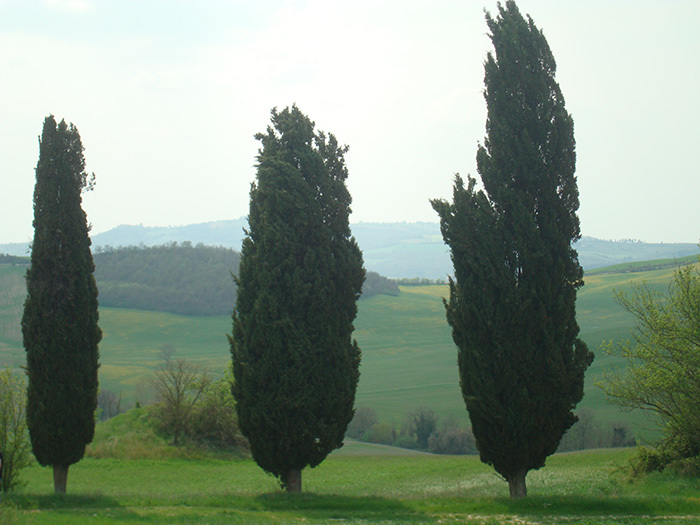 Cypresses form a striking addition to the landscape planted along routes and around settlements, their regular form punctuating the rounded shapes of the hills and their dark colour contrasting strikingly with the pale landscape. The colonization of the landscape involved creating new settlements for farmers and their families and labourers needed to work the land. It also involved greatly enlarging and improving existing villages. The most dramatic example of a planned new town is Pienza, named after its founder Pope Pius II who commissioned in 1459 Bernardo Rossellino to enlarge his village to create an ideal city with cathedral, palaces and civic buildings surrounding a central piazza, thus bringing together civil and religious authorities. Larger fortified settlements on hills include Montalcino, originally a 13th-century frontier post, Radicofani, Castiglion d'Orcia, Rocca d'Orcia and Monticchello. Elsewhere the landscape is studded with smaller villages on smaller hills, some also fortified. In many cases these settlements include remains of 13th-century buildings when Siena first gained control of the area, buildings from the great period of expansion in the 14th and 15th centuries, and also later buildings constructed under Florentine control in the 16th centuries. The World Heritage site is significant in that the large farmhouses assume a dominant position in the landscape and are enriched by prominent architectural elements such as loggias, belvederes, porches and avenues of trees bordering the approach roads. The strategic importance of the area, its connection with Siena, and its development, are all intertwined with the Via Francigena which has traversed the area north-south since Roman times (when it was know as the Via Cassia) linking Rome with the north of Italy and France. Since late medieval times, the route has been used an ecclesiastical route, linking the Church of Rome with its dioceses. It also facilitated a flow of pilgrims and merchants and generally allowed the transmission of people and ideas to enter the region. The route fostered the development of fine churches and monasteries such as the Collegiata di San Quirico in the Abbey of Sant'Antimo. In the Val d'Orcia (and also in Siena) the landscape is strongly associated with utopian ideals. Siena was a sort of 'commune' and the Val d'Orcia a model of sustainable rural development, and both manifested the highest aesthetic qualities. The ideal landscape was painted by Lorenzetti in the Town Hall in Siena in 1338-40; it became reality in the Val d'Orcia and was then immortalized in paintings by artists such as Giovanni di Paolo, and Sano di Petri, who in turn helped to strengthen the ideals. The Val d'Orcia is natural setting of extraordinary beauty. It has become known all over the world as the classic Tuscan landscape. Important films like the Oscar winners The English Patient, La Vita è Bella and Gladiator were shot here, as well as Romeo and Juliet directed by Franco Zeffirelli, and most recently Under the Tuscan Sun, cementing the Val D’Orcia’s beauty in cinematic history. Ultimately, Shadow Dancer by the American writer/director Brad Mirman was filmed over the course of six weeks in the splendid farmland among Radicofani, Castiglion d'Orcia, San Quirico and Abbadia San Salvatore. Bagno Vignoni is also the location where parts of Andrei Tarkovsky's 1983 film Nostalghia were shot. Bagno Vignoni is nowadays famous and appreciated all around the world as an outstanding health spa, surrounded by landscapes of stunning beauty. Besides its thermal waters, the most characteristic feature of Bagno Vignoni is its spa facility, which has remained unchanged through time. The water that surfaces in the main square of the town is very hot, with a temperature of 52° C.The thermal water pool is placed in the center of the square, surrounded on three sides by perimeter walls measuring around one and a half meter in height. There are also buildings designed by Bernardo Rossellino in honor of Pope Pius II and the loggia where Saint Catherine from Siena is said to have stopped. La Foce lies on the hills overlooking the Val d’Orcia, between Monticchiello and Chianciano Terme. Iris Origo's La Foce is the last, and in many ways the best, of the Anglo-Florentine villas. Created by an Anglo-American married to an Italian, it engaged with the land and the people of Tuscany in a way that few had done before; it also adapted to the changing economic and social conditions which ultimately destroyed the Anglo-Florentine community. Opening hours: the garden is open to the public every Wednesday afternoon. Guided tours leave from the Fattoria courtyard every hour from 3 to 7 PM (April-September) and 3 to 5 PM (October-March). "The Val d'Orcia itself, with its uncannily lunar crete senesi (clay-earth hillocks), had long become barren; prey to soil erosion, antiquated farming practices, rampant deforestation and social strife." La Foce was a farm-estate of roughly 7,000 hectares (“a place with enough work for our lifetime”, as Iris noted). Embedded in the Val d’Orcia, beneath the benign gaze of Monte Amiata – an extinct volcano as well as a site significant to the Etruscans – and with the fortified medieval village of Radicofani standing sentinel on the skyline, the estate had fallen to rack and ruin. The Val d’Orcia itself, with its uncannily lunar crete senesi (clay-earth hillocks), had long become barren; prey to soil erosion, antiquated farming practices, rampant deforestation and social strife. A forlorn desert of barren clay hills rising from a parched valley, the estate had been mismanaged for centuries. 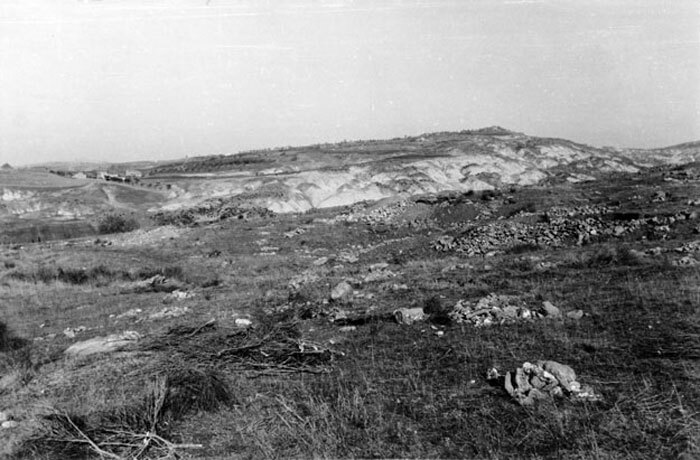 Only a fraction of the land was good, only a fraction of that was cultivated, the forests were neglected and the twenty-five outlying farms were in varying states of disrepair - some were virtually inaccessible while most contained several dozen inhabitants crammed into a few dark, airless rooms. To the south stood the black, basalt cliffs and towering fortress of Radicofani, to the west was the summit of Monte Amiata, an extinct volcano which blocked the sea breezes but did nothing to stop the bitter tramontana wind from the north and the hot dry scirocco from the south. To live in the shadow of that mysterious mountain, to arrest the erosion of those steep ridges, to turn this bare clay into wheat-fields, to rebuild these farms and see prosperity return to their inhabitants, to restore the greenness of these mutilated woods - that, we were sure, was the life that we wanted. The Origos briskly, pragmatically, set about restoring the infrastructure of the entire estate. They implemented progressive social ideals as well as far-seeing farming methods which employed innovative agricultural practices. The estate’s farm-houses, eventually more than 50 in all, were renovated and/or completely rebuilt; the main villa was refurbished; and a school and dispensary were created, the latter named after Gianni, the Origo’s first-born, who had died of meningitis at the ageof seven. In 1933 Pinsent added the chapel and cemetery which he considered one of his finest works. Situated in woodland at some distance from the house, the cemetery was enclosed by cypresses and walls, against which grew pittosporurn, and it was planted by the Marchesa with blue periwinkle and roses amongst the graves so that it formed a garden, a thing unknown in Italy at that time. Atilla is said to have introduced the maremmano oxen from the Hungarian steppes to plough the heavy Italian soil; these picturesque creatures were loved by the Anglo-Florentines, as much for their noble patience as for their utilitarian strength. Gradually the maremmano were interbred with the chianini, finer white oxen from the Val di Chiana whom Origo described as 'gentle as evening moths'. Near La Foce, are the Renaissance and medieval towns of Pienza, Montepulciano, Monticchiello, San Quirico d'Orcia and Montalcino. The countryside abounds in lovely walks among woods and the characteristic crete senesi (clay hills) and famous wines such as the Vino Nobile and Brunello can be tasted in the local cellars. Pienza is the 'touchstone' of Renaissance urbanism. Pienza was rebuilt from a village called Corsignano, which was the birthplace of Enea Silvio Piccolomini. The leading humanist Enea Silvio Piccolomini (1405-64), elected to the papal throne in 1458 as Pius II, was born in Corsignano, situated on a hill overlooking the Orcia and Asso valley a short distance south-east of Siena. When he returned there after becoming pope, he was struck by the extreme misery of its inhabitants, which inspired him to endow his birthplace with new buildings, and make it his summer court.. The monumental center of Pienza is the Piazza Pio II, living example of the utopian ideal city designed by humanists architects of the fifteenth century. The square rontains all the main buildings of the village, the Cathedral, the Bishop's Palace, the Palazzo Piccolomini, Municipal Palace, the Palauo Ammannati and a fine 15th century well. By his death in 1464, Pius had rebuilt the town’s medieval centre into a crown jewel of the Renaissance, and renamed the town after himself. local travertine stone. The cathedral was built out over the slope of the hill, and its apse has subsided. A crack runs across the floor and up the transept walls, noticeable even at the church’s dedication in 1462.
painters of the day, Giovanni di Paolo, Matteo di Giovanni, Sano di Pietro and Lorenzo di Pietro called Vechietta. Pienza has been designated as part of the world-wide heritage of humanity by UNESCO. The Piccolomini Palace was built in 1459 by famed architect Bernardo Rossellino. The Piccolomini family lived in the Palazzo until 1962. On the ground floor, the inner courtyard and rooms present the architectural structure; several exhibition stations illustrate Pius II's ambitious humanist project for the ideal city. The first floor is the location of the appartamento nobile where the halls open onto the rooms: the dining room, the music room, the study, the weapons room, the library, and several bedrooms, including that of Enea himself. The piano nobile rooms are furnished with antiques of the period, paintings, objets d?art, and many tokens of a past that still remains intact. The true architectural theme of Palazzo Piccolomini is its relationship with nature and the landscape. From the portico on the rear, unfolds an extraordinary view of the Valdorcia and Monte Amiata. Inserted into this panorama, on the ground floor of the palazzo, a square-shaped garden bound by walls with a well in the middle, is the first hanging garden of the Renaissance. Montepulciano, is built along a narrow limestone ridge and, at 605 m (1,950 ft) above sea level. The city, full of elegant Renaissance palaces, ancient churches, charming squares and hidden corners, boasts vast panoramas all over the wonderful Val d'Orcia and Val di Chiana valleys that surround it. Montepulciano is encircled by walls and fortifications designed by Antonio da Sangallo the Elder in 1511 for Cosimo I. Inside the walls the streets are crammed with Renaissance-style palazzi and churches, but the town is chiefly known for its good local Vino Nobile wines. a long, winding street called the Corso climbs up into the main square, which crowns the summit of the hill. As in Cinigiano, Calici di stelle is the main summer event in Montepulciano. The Strada del Vino Nobile offers an enogastronomic tour in the various Quarters of Montepulciano with wine tastings and a typical dinner under the guidance of expert Sommeliers and never the less various entertainments and music shows. The Bravio delle Botti takes place on the last Sunday of August along the main alleys of the town centre of Montepulciano. It is an original challenge between the eight Contradas that compete for a painted cloth banner. The two athletes, called Spingitori, roll 80 kilos barrels in a uphill race for about 1800 metres along the main street of the town through the historical centre, until they reach the churchyard of the Duomo in Piazza Grande. The town is located to the west of Pienza, close to the Crete Senesi in Val d'Orcia. The first medieval walls were built in the 13th century. The fortress was built at the highest point of the town in 1361, on a pentagonal plan designed by the Sienese architects Mino Foresi and Domenico di Feo. The fortress incorporates some of the pre-existing southern walls, the pre-existing structures including the keep of Santo Martini, the San Giovanni tower and an ancient basilica which now serves as the fortress chapel.Though the town itself was eventually conquered, the fortress itself was never taken, an admirable feat, considering the size of the Sienese and Florentine forces that besieged Montalcino at varying intervals. Down the narrow, short street that extends from the main gate of the fortress is the Chiesa di Sant'Agostino with its simple Romanesque façade, also built in the 13th century. The Duomo (cathedral), dedicated to San Salvatore, was originally built in the 14th Century, but it now has a neo-classical appearance thanks to extensive renovation work that was done in the early 19th century under the direction of Sienese architect Agostino Fantasici. originally the Piazza della Principessa Margherita, is down the hill from the fortress and Duomo on the via Matteotti. The principal building on the piazza is the town hall, once the Palazzo dei Priori (built late 13th, early 14th century) which was for many years the Palazzo Comunale. The palace is adorned with the coats of arms of the Podesta who once ruled the city. A very high medieval tower is incorporated into the palazzo. Close by is a Renaissance structure with six round arches, called La Loggia, which was started at the very end of the 14th century and finished in the early 15th, but which has undergone much restoration work over the subsequent centuries. The Abbey of Sant'Antimo (Abbazia di Sant'Antimo) is a beautiful Romanesque church, in a picture-perfect setting just south of Montalcino. It sits in a large valley with views of the hill town Castelnuovo dell'Abate, rolling hills covered in olive groves and vineyards, and wild forests. Sant'Antimo is "one of the finest Romanesque religious buildings in Italy." Its name refers to Saint Anthimus of Rome, whose relics were moved here during the late 8th century. The Romanesque church was built during the 12th century, in order to enlarge the preexistant monastery. As such, the actual structure is the result of diverse constructions and modifications executed over the centuries. the night and of the day. 9.15 - 10.45 a.m. / 3.00 - 6.00 p.m.
San Quirico d'Orcia, a small medieval town where you can breathe the history of Tuscany, is a charming town on the northern edge of the Val d'Orcia, on the hills that separate the Val d'Orcia from Val d'Asso. 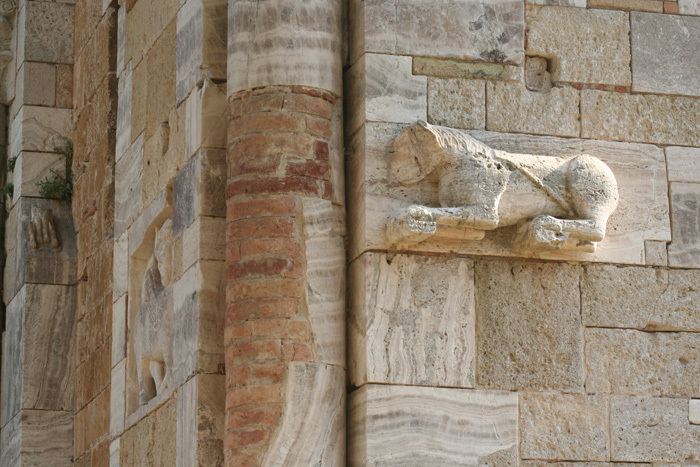 Among the most important monuments are to be mentioned the beautiful Collegiate church of Saints Quirico and Giulitta, built over the ruins of the church of Osenna dating back to the eighth century, with a magnificent Romanesque portal with zoomorphic sculptures and a lintel with the fight between monsters. On the right side there is another Lombardic portal supported by caryatids from the school of Giovanni Pisano. On the back of the collegiate there is Palazzo Chigi, built by Carlo Fontana for the Cardinal Flavio Chigi. Walking down the via Francigena, today called Via Dante Alighieri, you arrive in Piazza della Liberta’ with the church of San Francesco, bearing a Madonna painted by Della Robbia. On the square there is the Porta Nuova, opening to the Horti Leonini, an Italian style garden built by Diomede Leoni in 1540. Continuing you come to the church of Santa Maria Assunta, in Romanesque style with Lombardic influences, with another interesting portal built with material coming from the Abbey of Sant’Antimo. Bagno Vignoni is known since Roman times for the curative properties of its thermal waters. The peculiarity of this village is the lack of a central square, which was replaced by a huge tub in the 16th century, fed directly from the termal source - making Bagno Vignoni a very special place. The thermal baths, probably well known even in Etruscan times, were definitely enjoyed by the Romans as testified by a plaque located under the arcade of the church of San Caterina, which indicates the consecrating of these waters to the Nymphs. Thanks to their close vicinity to Via Francigena, important thoroughfare which connected northern Europe to the Italic peninsular, these baths became more and more popular during the medieval period. Bagno Vignoni became a halting and refreshment point for the numerous pilgrims who traveled the Via Francigena on their way to Rome, one of the main destinations for the Christian pilgrimages. The thermal waters of Vignoni were used both for personal hygiene and for curing numerous illnesses. For this reason the spa also became a popular resort for famous dignitaries like Pope Pio II Piccolomini and Lorenzo il Magnifico. 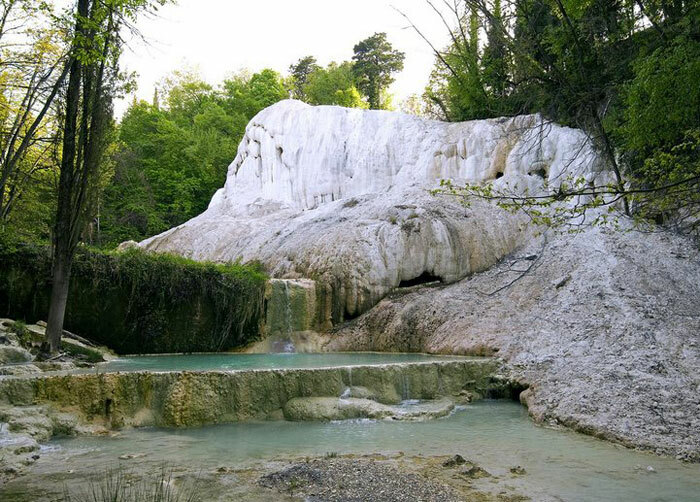 In the heart of the Val d’Orcia, San Filippo is characterized by suggestive calcareous sediments made by the hot sulphurous water. San Filippo is only half an hour away from Bagno Vignoni and it has a similar past: the waters of San Filippo were known by Romans, became famous in Middle Ages, treated famous people like Lorenzo il Magnificio and other princes of the Medici family. The huge oak tree at Le Checche is situated near Pienza along the provincial road no. 53 which goes from Bagno Vignoni to Radicofani, across the Val d'Orcia. The oak tree (Quercus pubescens Willd), is characterized by large, imposing, cross branches; it is 360 years old, it is 20 mt high, with a diametre of 19 mt; the girt of the trunk is of 4,65 mt. Dotted with cypress trees and the dramatic slopes of the volcanic mountains Amiata and Radicofani, the natural park of the Orcia Valley is one of Tuscany’s best-preserved natural wonders just added in the UNESCO's WORLD HERITAGE LIST and is universally recognized as one of the most beautiful landscapes on Earth. Katie Campbell , A modern pastoral in an ancient landscape - Iris Origo's La Foce, in Paradise of Exiles: The Anglo-American Gardens of Florence, pp. 154-167. Located on the outskirts of Castiglioncello Bandini, Podere Santa Pia offers the quiet tranquility of a private retreat, with numerous attractions and gorgeous small hillside villages only a short drive away. Enjoy the exquisite art, museums and churches in the nearby cities, then relish the cuisine and epic countryside of the Maremma. Podere Santa Pia highlights the best of the quintessential Italian region. The landscape ot the Val d'Orcia as it unfolds nowadays was created by wealthy Siennese merchants in the 14th and 15th centuries. The farms cultivate mainly grains, vines and olives. Rows of cypresses are also a distinctive sight. The beauty of the area inspired Renaissance painters and early travellers on Via Francigena. And Iris Origo.